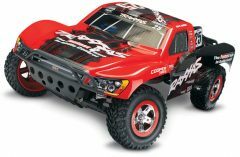 You cannot add "Traxxas Stampede 1/10 Scale RC Monster Truck" to the cart because the product is out of stock. SKU: 4944258035239. 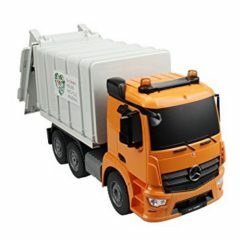 Categories: Cars, Remote Control. The Savage XS Flux packs in everything you know and love about the neck snapping, standing back-flippable Savage Flux! 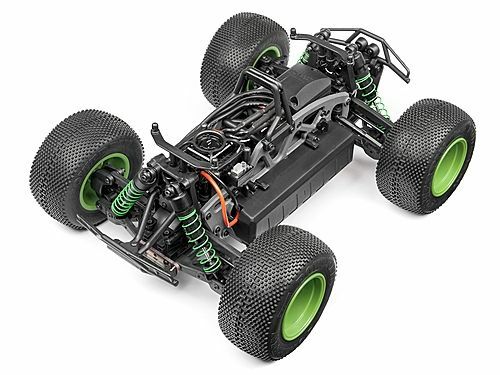 A ridiculously powerful Flux brushless powerplant to provide you with the most menacing speed runs, legendary Savage durability that passes the bashing exam with flying colours, innovative TVP technology for a class leading design, and extreme monster truck appearance and ground clearance to conquer it all. The compact Savage XS Flux is just 2/3 the size of a standard Savage FLUX XP, so it’s the perfect size for backyard tracks and smaller areas. 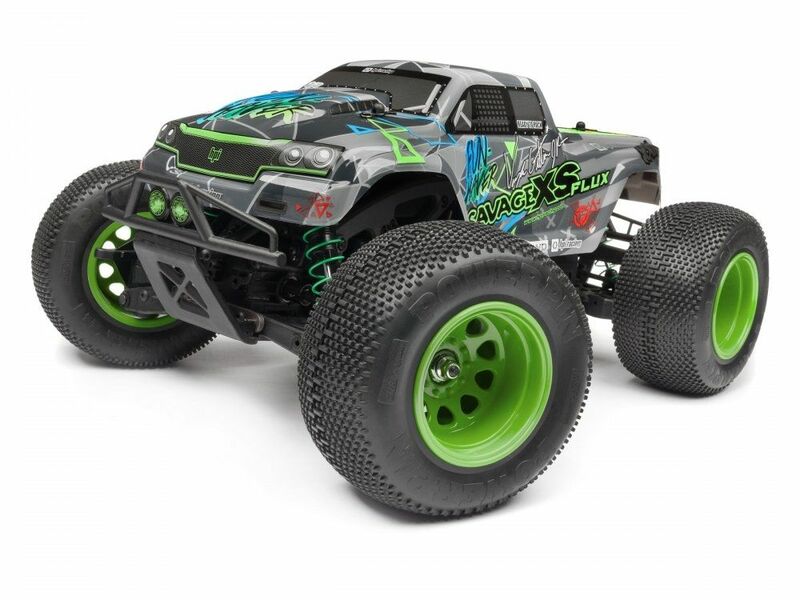 The Savage XS Flux is built tough with an all-metal drivetrain so it can handle giant jumps and speeds over 65mph! 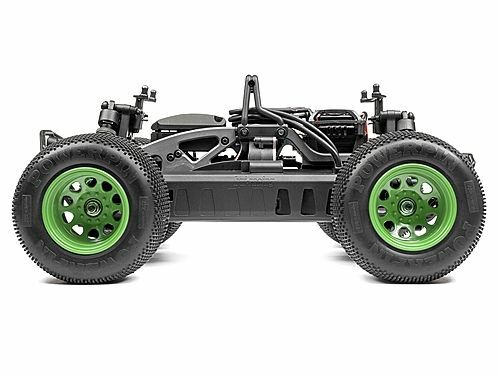 The 4WD system provides excellent traction on any off-road or on-road surface you can throw at it. And it’s all built with legendary Savage toughness so you spend more time driving and less time wrenching. The awesome ‘geometric’ design that covers the body comes straight out of the design studio of Formula D champion Vaughn Gittin Jr! It’s a version of the competition livery that wraps Vaughn’s drift-spec Ford Mustang RTR and is just jaw-dropping cool! 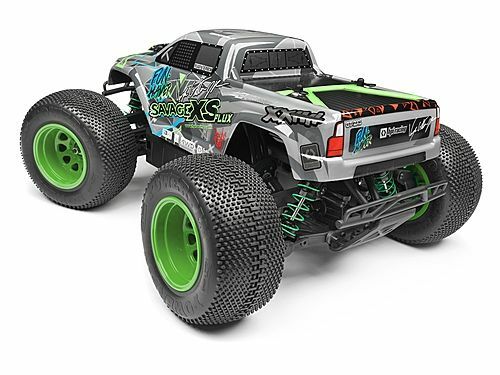 The bright green and blue colours really help the Savage XS FLUX mini-monster truck stand out from the bashing crowd, and the matching highlights on the bumper lights, wheels and shock springs tie it all together. The Savage XS Flux features waterproof electronics so it’s ready to tackle wet conditions like rain and snow! The RF-40WP receiver is safely stored in an enclosed receiver box, protecting it from the elements and ensuring glitch-free operation. The water resistant SS-20WR steering servo and waterproof EMH-3S electronic speed controller complete the package, allowing you to enjoy the action on the road no matter what the weather is like! Please note: the electronics are not designed for submerged operation. Be sure to rinse off any dirt or salt water with clean water immediately after driving. 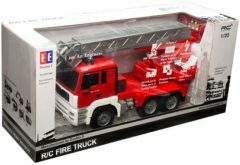 Check the receiver box to make sure no water is inside and let dry fully before driving again. 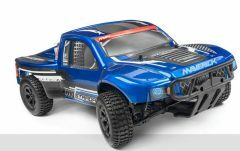 The Savage XS Flux is ready to go right out of the box, including a 2.4GHz radio system and 3S-capable Flux brushless system. 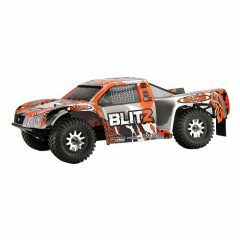 Just add your favourite Li-Po battery pack like the HPI Plazma 7.4V or 11.1V batteries and start driving! This edition of the Savage XS Flux also features the awesome looks of Vaughn Gittin Jr’s Fun-Haver styling! The 65+ MPH Savage XS Flux – The World’s Fastest Mini Monster Truck. PERIOD.